That is a beautiful scarf! Such a gorgeous green and I love felted things. Never seen anything quite like it,How wonderful,Linda:) Please enter my name into the Hat, and if you have time please visit us at.. I love this scarf---your dolls are incredible--do you go to MMM? I was there a couple of years ago! It was awesome! Would just love this!! Please add my name to the list of hopefuls. slavetobeads@gmail.com I too have a nice giveaway. It is so beautiful!! !Please enter me...m..
Hi! I am felting fanatic also! never made a scarf though!I would love to have yours! A scarf: how very useful. And I love felting (used to do it). Super!! I love any kind of scarf...handmade is best by far. I could use it to keep the Wisconsin chill away. Take care! Love scarves! hop over to #220 to enter for my giveaways too! What a beautiful Scarf...looks so warm. What a fantastic giveaway! Simply stunning! A lovely giveaway. Thanks for the chance to win it. Oh, it's beautiful! please include me in your drawing! Thank you and you are welcome to visit my blog too, I'm # 96 on the list! I'd be thrilled to win your wonderful felted scarf, perhaps I may be the lucky one. Thanks for your visit and lovely comments on my #70 stopover. Lovely scarf - please add my name to your list! A wonderful giveaway!! I hope I win!! Please add my name, too! Very pretty scarf! I gotta ask - is it alpaca? No this is all merino and silk. Still working on felting alpacha. Lovely. Please include me in ht edrawing. Wonderful giveaway that I would love to have; your scarf is fantastic! Please enter me! This is such a beautiful giveaway! I'm going to visit you Etsy shop shortly! It is so good that the magic carpet brought me to see another felter. Your nuno looks great, I'd love to win it. A felted scarf? How cool! What a neat giveaway. I stay cold and usually keep a scarf around my neck to keep me warm. I would love winning this one. What a lovely scarf! I'd love a chance to win it. Wonderful giveaway! Please do include me in your drawing and thank you so much! Great giveaway :) thanks for stopping by my blog earlier! Wonderful giveaway! I also have two corgis! What wonderful dogs they are. 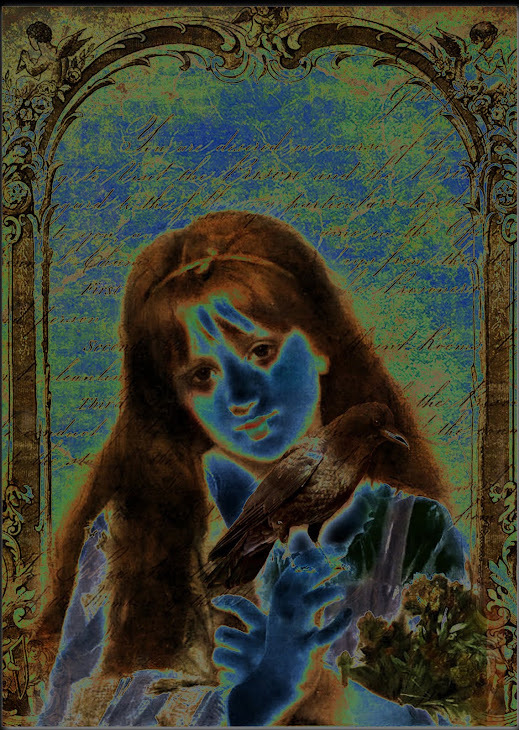 Please stop by my blog if you have a moment. I am #545 on the tour. I adore fiber arts. Your felt work is gorgeous. LOVE that scarf. Your scarf looks very nice. I suspect the picture dose not complement it. I love felting, and made some felted beads and dolls. I'd love having your scarf to keep me warm it the cold New Zealand winter. Gorgoeus scarf, would love to be entered in your giveaway. Just want to touch it! Thanks for visiting my blog. Count me in. What a beautiful color! Please include me in your giveaway! Oh, thanks for the chance to win! I have a Corgi too, and do a lot of auction items for Corgi-Aid too!! I'm so glad I visited your blog! Your scarf is gorgeous! Would love to be entered! This scarf is so elegant, it is understated. I'm thoroughly psyched about learning felting. I have yet to try it, but I have the roving, which I understand is the first thing you need. I take it this was wet felted? I'll definitely be back to learn more from you. Lovely scarf, thanks for the chance to win. Fly over to my blog and enter mine. Lovely scarf! Please enter me. Such a pretty scarf! Please enter me! Please join me on my magic carpet ride too! What a lovely scarf and a great prize! Please enter me in your drawing and stop by my blog to get a chance at my beautiful hand dyed scarf! Such a beautiful scarf! I would love a chance to enter. Thanks for the chance to win this gorgeous scarf. Beautiful! Do stop by and visit me! Oh, breathtaking! The color is wonderful, real true enchanted forest green. I would wear that scarf even if it was 90 degrees out, it's so gorgeous! Glad you joined the Ride! A felted scarf sounds oh so snuggly. Lovely! I could use that scarf! It's cold in FL this winter!! All your work is beautiful! would love to wear the scarf! Oh my goodness, what a beautiful scarf. Please enter my name into your fabulous drawing for a chance to win. I love the scarf. It'd be so nice to wrap around on these cold winter mornings. What a lovely blog...your scarf is beautiful. Stop over and visit me, if you haven't already...I am a lil behind on reading. It has been cold here in the South this year. Your lovely scarf would feel wonderful around my neck! Love the colour and the look and style of your scarf! I am keeping my fingers crossed! Wow,this is stunning, love the colour! What a great give away, I would love to win, please count me in. What a greay give away event, please count me in! A great give away - a beautiful felted scarf! I just found your blog. What a great gift! Please enter me and then when you have time stop by and enter my giveaway. Oh my, this is lovely! Please enter my name in your draw - thanks so much! Good morning, this is a great blog and your art is awesome. Please count me in on your giveaway. Your felted scarf is beautiful! Please enter my name in your draw -- thank you!! Hi FiberArtistToo, what a lovely idea and post you have. I love the gorgeous scarf. I'd love to win. I absolutely love your gifts. Please take time to visit my blog, too, for a chance to win my book, 16 x MOM: A Mastery of Motherhood. I'm working on getting all the country flags. I promise to revisit your's too. What a wonderful giveaway! Please enter me in it. Lovely scarves in my favourite colour! Thank you for being part of the ride Libby! the scarf looks beautiful-i haven't seen this type of felting before. Please enter my name in your generous drawing. I hope you are having fun on this blog hopping event checking out all these creative people. Here's hoping that the OWOH lovefest will help your mood and bring you up a little. I would so love to win one of your lovely green scarves. Please sign up for my giveaway too! Cheers and enjoy the ride ! 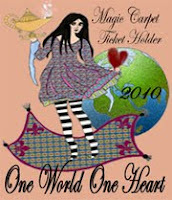 Hope on the Magic Carpet and come over to my blog for a chance to win my beaded bracelet. I am #362 on the list. I'm such a scarf lover, and green is my fave color, and it would look gorgeous with all my faery garb - ooooh! I love green and this scarf is gorgeous. Love your blog and felted giveaway! What a nice giveaway. I would love the scarf. Thanks for the chance to win. Thanks for visiting my blog. Your felted scarf is beautiful. I am also a felter and would love your scarf, thank you. Please stop by my blog #840 to see the felt flower brooch I am giving. Ooh pretty - and WARM - always good when you live in Alaska! Thanks for stopping by my blog, and please enter me in your giveaway! Your scarf does look like a magic carpet! It's very pretty! Thank you for visiting me at Loveleigh Treasures and entering my giveaway, I wish you luck! It was a pleasure to meet you on the magic carpet ride and I hope you have a wonderful day! I love anything felted so please include me in your lovely giveaway! What a beautiful scarf! And such a lovely color. I'd love a chance to win too! What a piece of cozy luxury you're offering! What a beautiful felted scarf! I love your presentation. Beautiful scarf, I would love to win! nice to meet you and thank you so much for visiting my blog! Charming and a beautiful blog with a stunning scarf treasure! I love your scarf....It is lovely. Please enter me! I love scarves! Please enter me! Great scarf! Hope to win it! Your art is just wonderful, I was looking through your site and shop and I just love the eclectic mix of color and textures you use. Wonderful. You are offering such fabulous scarves! I invite you to visit my blog giveaway I have fresh baked brownies and cinnamon tea prepared for my visitors! Ohoo, how lovely! Please include me and thanks for stopping by #314, Lotion in a bar! I am almost never out without a scarf. Even have some for summer. Would enjoy this for sure. I love the scarf. I really would like to find the time to learn about felting. I would like to be entered in your drawing. Only 5 more years and you will be "free at last". Congrats on going back to school too! Your giveaway is too cool! It's beautiful! Your scarf is heavenly! Please enter me in your giveaway, and don't forget to fly my way (#922)! Beautiful scarf, and thanks for coming to my blog. Thank you, would love this,very special. Really enjoyed your youtube video, beautiful art! Cobweb felted scarf...sounds DIVINE!!! Please count me in as I would be thrilled to be the "lucky" one! Your felted scarf is lovely. I would love a chance to win! Love your scarf & great blog! PS. Lived outside of Augusta GA many moons ago ~ my 42yo son was conceived there. Lovely scarf! Please enter my name to the giveaway! Thanks for stopping by my drawing, too! Beautiful!! Please sign me up! And please check out my blog for more OWOH action! It is a beautiful scarf. I have enjoyed looking around your blog. Please include me in your drawing. I would LOVE to be included in the draw for your gorgeous felted scarf. I am in love with felting and have just started making a few items which I am enjoying. Your scarf would give me such inspiration. I have bookmarked your blog and will be back. Please do come by #70, take a look around and enter into my draw. Great meeting you. awesome giveaway! Please enter me in your drawing! What a great video, I want the dragon! Thanks for coming and visiting me. Your scarves are wonderful! Please count me in! Keeping my fingers and toes crossed here in snowy Virginia! Great giveaway...I would be honored to win. Enchanting Felted Scarf OWOH Giveaway! beautiful giveaway! Crossing my fingers! Hello from England! I'd love to be included in your giveaway, thank you. Love the scarf you have made as your OWOH giveaway prize. Please add my name to your growing list of hopefuls! And thank you for stopping by last Wednesday to enter mine as well. Nice meeting you! LOVE your felted scarves! Thank you for your generosity! Please visit me at #833. I am offering a Marie Antoinette Doll Necklace. Enjoy the Carpet ride! I love green and even have green eyes, so your scarf would be just perfect for me. Thanks for offering such a lovely prize! It's a beautiful scarf. Fantastic giveaway. I would love a chance to win. Please enter me. It is beautiful! Please stop by my blog(#921)!